The Outfit Along is back for a second year! 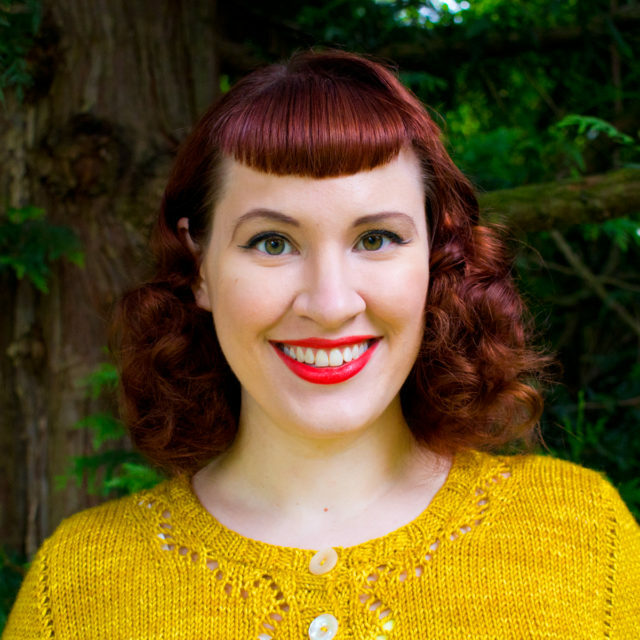 Once again, Lauren from lladybird.com and I are joining forces to combine a sew-along with a knit-along. The idea behind the Outfit Along is to make a complete outfit by sewing a garment and knitting a garment. The official sewing pattern will be McCall 6887, and the official knitting pattern will be my new cardigan pattern, Vianne. Lauren will be blogging about the official sewing pattern and I’ll be blogging about the knitting pattern to help you along the way. If you don’t love the official patterns, you can still join in! The Outfit Along is about making an outfit you’ll really wear, so to participate, all you need to do is to sew a garment and knit a garment to make an outfit. You’re more than welcome to pick projects that fit your own style and skills. You can look through the 2014 Outfit Along FO thread in the Untangling Knots group on Ravelry to see the variety of patterns people chose to use last year. The Outfit Along will start June 1st which gives you a little time to start planning your projects. The deadline is July 31st, so you have two months to make your two pieces. If you post photos of your final outfit in the OAL Finished Outfit thread in the Untangling Knots group on Ravelry by July 31st, you’ll be eligible to win some fun prizes like Untangling Knots knitting patterns and sewing patterns so you can keep making outfits. Prize winners will be randomly selected from those who finish both their knit and sewn garments and post pictures in the appropriate thread by the deadline. Instead of throwing everything at you at once this year, we’ll get started with the blog posts on the knitting pattern here on June 1st, and a few weeks later, on June 22nd, the sewing pattern posts will start up on lladybird.com. If you knit and sew along with us, you’ll get your projects done in plenty of time. So make your plans, dig through your stash, and get ready! Vianne, the offical knitting pattern, will be available for 20% off up on Ravelry until the OAL officially starts on June 1st using the coupon code OAL2015. It’s totally seamless, and knit using DK weight yarn on US 8/5 mm needles to make a lighter weight fabric. You can read more details in the Untangling Knots shop or check Vianne out on Ravelry. 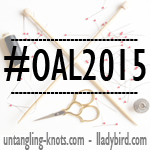 Help spread the word and grab one of the badges below or use the hashtag #OAL2015. 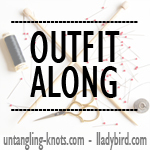 If you want to hang out and chat about the OAL, come join the Untangling Knots group on Ravelry. Yay, so glad the Outfit Along is back! 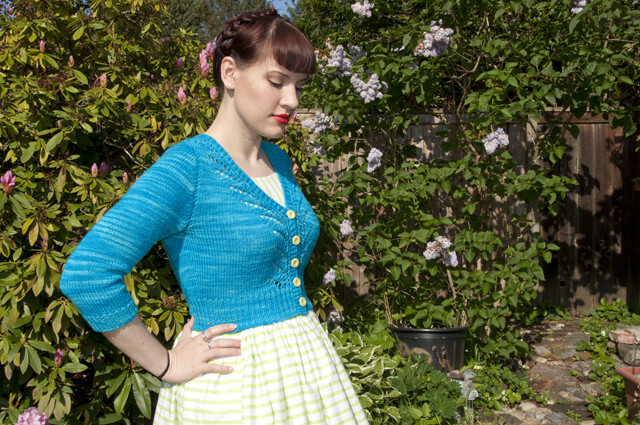 I actually had plans for a Hetty, but Vianne is also really gorgeous and I’m sure I’ll knit it sooner or later! I’d love to have a go at this, is sounds rather fun! As long as my sewing machine is behaving! I’m in and I’m really looking forward to making my own outfit! I’ll be using Mary Mead for the knitted garmentbut I don’t have any plans for the sewing part of the OAL yet. Woo hoo! I had so much fun with this last year. I LOVE Vianne. Nice job on that! I am loving the idea! and will be purchasing your lovely cardi. I was looking at my wools and have one that fits the tension square in stitches but makes the swatch with less rows. Will you be doing explanations on how to adapt to that? or am I better finding something that matches perfectly? I’ll be blogging about the KAL once the KAL starts. I THINK I’m participating in the OAL – I regularly read Lladybird. I just read the comments about changing patterns, and see a question I should have asked about the knitting. I’m doing a lacy wrap, Cascade Yarns FW192, Forest Hills Dayflower wrap. Although a longtime knitter, I’d not done lace before so wanted to focus on that in lieu of shaping. Plus didn’t want a fitted sweater. So, am I in with this? One of her posts says a wrap is not a garment…. Thanks, your new patterns review looks interesting! A wrap is an accessory so it does not count for the OAL. The idea is to make two garments with all of the challenges that come with those, including fitting. Think sweaters, vest, skirts, etc.